The choice of the nozzle determines the type of jet and the flow rate. For insecticide and fungicide treatments, a conical nozzle is the most suitable as it offers great spraying fineness. 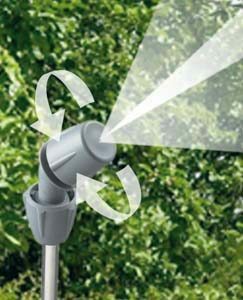 For weed control : a fan nozzle or an anvil nozzle. The fan nozzle (vertical jet) is more suitable for localised weed control (with or without shield). For larger areas, go for an anvil nozzle which has a 90° jet. The operating pressure determines the fineness of the water drops and/or their speed. Wind deflects the droplets, intense heat leads to very rapid evaporation.